If you have torn your anterior cruciate ligament (ACL), then you will most likely have done it in the following way. You will have suffered a twisting injury to your knee whilst playing sport. You may have heard a “crack” sound during the injury. That was the sound of your ACL rupturing. You will have been immediately unable to continue playing due to the severity of your injury. A large swelling will have developed around your knee within half an hour of the injury. This is caused by your knee joint filling with blood. This swelling may have lasted for up to two weeks after your injury. After your injury, you will find that your knee “gives way” from underneath you from time to time. This frequently occurs when using stairs. This instability happens because your ACL is no longer there to provide the stability it once did. 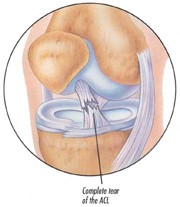 An MRI scan can confirm your ACL tear and any other dysfunctions from the trauma. Your decision to opt for surgery isn’t to be taken lightly. You will be on crutches for a couple of weeks after the procedure. Your rehabilitation period will continue for months after that. Generally surgery is advocated if you want to continue playing sports, because the instability, or “giving way” would otherwise hamper your performance.